In heat and drought, the few plants that thrive endear themselves to me. At the top of that short list are silvery-leaved Artemisias, named for the ancient Greek goddess of the moon and of the hunt. Like Artemis, her plants have a strong, independent personality: their flowers are completely uninteresting  but their foliage shines. 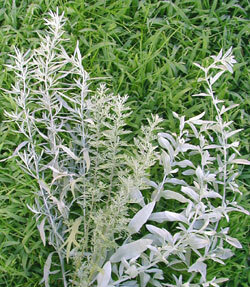 Artemisia ludoviciana has many popular varieties; I'm currently growing 'Silver King' and 'Valerie Finnis.' Both are two to three feet tall, with bright, almost-white foliage. I like the slenderer leaves of 'Silver King,' but I also like the fact that 'Valerie Finnis' tolerates a bit of shade and moisture, where other Artemisias would rot from fungus. Roman wormwood (A. pontica) grows shorter than the ludovicianas, is more finely textured, and has a little green in the leaves, so that it looks like a billowy mass of silver-mint colored lace. It makes a bouquet look romantic. 'Silver Mound' -- probably the most commonly grown artemisia -- makes a pretty, 12-inch tall dome if you don't give it too much water or nitrogen. (Cutting it back also helps prevent that open middle that happens if it gets too leggy and flops over.) It's perennial, but not so hardy as other artemisias. To control the pontica and Valerie, I rip out new shoots that come up in the middle of neighboring plants, along with as much of their stolons as I can get. With the 'Silver King,' however, I got organized. I bought a 20-foot roll of foot-wide aluminum roof flashing, unrolled it along the bed, dug a trench between the artemisia and the lawn, and buried the metal vertically all but a half-inch, for a root barrier. It works great! Unfortunately the bed was a few inches more than 20 feet long, and I couldn't get myself to buy another whole roll. So every year, I pull up 'Silver King' too. Oh, well: think how much bigger the job could be. In the photo, that's 'Silver King' on the left, pontica in the middle, and 'Valerie Finnis' on the right.